The only way to truly take in the fabulous Sin City is to have your own place right on The Strip. With a timeshare resale or rental at the Hilton Grand Vacations Club on the Boulevard, you'll save thousands on your future Vegas vacations. What’s My HGVC on the Boulevard Timeshare Worth? This Hilton Las Vegas Strip timeshare resort certainly knows how to craft amazing getaways in the Entertainment Capital of the World. Located at the northern end of The Strip, the Hilton Grand Vacations Club on the Boulevard offers unparalleled access to all of Vegas's best and most classic attractions. In just a few minutes, you could be strolling past the Bellagio Fountains or stopping in for a show at Caesars Palace. 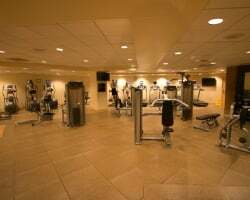 The resort itself pulls out all the stops in providing the very best accommodations a Las Vegas resort can offer. Perhaps the most important distinction is the property's family friendly mission statement. Unlike other resorts in the Las Vegas area, this Hilton Grand Vacations Las Vegas resort focuses on providing multi-bedroom suites and unique on-site amenities that cater to families traveling with children. Are you ready to secure your yearly accommodations at the Hilton Grand Vacations Club on the Boulevard? SellMyTimeshareNow.com features timeshare resales and rentals at discounts of up to 70% through an active online marketplace. Fill out the form on this page or call 1-877-815-4227 to learn more. When you purchase a timeshare resale at the Hilton Grand Vacations Club on the Boulevard, you'll not only acquire guaranteed accommodations, you'll acquire them for much less than others pay. Because the timeshare resale advertisements on SellMyTimeshareNow.com are for-sale-by-owner, they are listed for prices that are significantly less than what the resort itself offers. In just minutes, you could be submitting purchase offers on floating weeks or Hilton Grand Vacation Club points during Hilton's Gold and Platinum seasons. What's more, as a timeshare resale owner, you'll be enrolled in Hilton's HHonors rewards program, and can unlock vacation extras and perks once you start traveling. Your Hilton on the Boulevard timeshare resale can be your ticket into the Hilton Grand Vacations Club, one of the world's best vacation ownership brands. With few resale restrictions to speak of, you can start using your HGVC points to make reservations at the Boulevard resort and other Hilton resorts almost immediately. While you won't be enrolled into the club at the Elite level, you'll still have access to banking and borrowing points and other benefits that non-resale owners enjoy. The Hilton Grand Vacations Club on the Boulevard is affiliated with RCI, the world's largest timeshare exchange company. If you pair your Hilton Grand Vacations Club on the Boulevard resale with a separate RCI membership, you'll be able to deposit your week or points into RCI's database and trade your accommodations in Vegas for stays at other resorts across the world using RCI points. Additionally, the resort has earned a Gold Crown rating from RCI, the highest possible achievement for superb accommodations and guest experience given to affiliated resorts. These Hilton Grand Vacations suites on the Las Vegas Strip include a wide range of amenities designed to make your Las Vegas trips complete. Not many properties on The Strip offer an on-site outdoor swimming pool, but the HGVC on the Boulevard has two. The Eforea Spa offers treatments for men, women, and couples alike, and is guaranteed to help you leave the stress of daily life behind while you're on your trip. 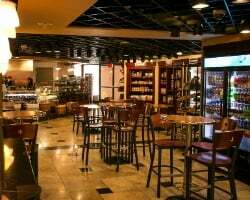 The Boulevard is also home to a deli, a marketplace, and a poolside bar and grill that serves snacks, drinks, and lunch. The immediate area is full of things to do and see, allowing you to craft your ideal Las Vegas getaway. Spend your nights bouncing from casino to nightclub and back again, whether you're at the blackjack tables at the Venetian, or the shark reef at Mandalay Bay. Families will undoubtedly love the live shows that The Strip has to offer, with acts like the Blue Man Group and Cirque du Soleil performing regularly. Golfers will also be delighted to find a variety of courses in the area, such as The Wynn Golf Club and Las Vegas National Golf Course. 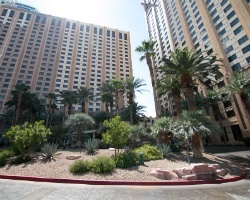 Already Own at Hilton Grand Vacations Suites on the Las Vegas Strip?